IDP Italia was created in 1981 with the idea of bringing the popular and highly requested leather products made in Italy to the world marketplace. In collaboration with the historical Italian tanneries, IDP was able to propose to the market exclusive hides, becoming one of Italy's most renowned companies within the industry for the quality of their products. The historical development and the interest in following industry trends, lead IDP to expand the production with collections of sofas and armchairs. Today IDP creates truly unique designs, ranging from power motion sofas and chairs, to sectionals and unique accent seating. At IDP we take great pride in the furnishings we make. Sensitivity, discipline, dedication. The care of every detail, the accuracy of each seam, the selection of leather choices; each model has all of our attention. Ours is a company made up of individuals. Contact, listening, acceptance, are the hinges of our work and this ensures every product possesses a soul. Because it is created by passionate individuals. Not only is it the creation of objects, but also stories to live and passions to recount, emotions shared. The quality of our products has always been guaranteed by the extreme attention and constant control of the entire production cycle. From the joinery, to the cutting of the hides, to packing and shipping. Each production phase is characterized by craft processes which emphasize the care of the detail and finish. IDP combines tradition and technology, craftsmanship and industrialization. The preciousness of the manual cutting together with the precision of electronic cutting ensures a strictly high quality of individual product. Made in Italy. Our exclusive leather hides are used as the primary covering for all of our designs. Made in Italy and for us a concrete value, made of quality raw materials and a historic tailoring experience. We interpret the Italian style of living reprising the spaces with products which become comforting protagonists of our everyday living. IDP is certified 100% Made in Italy by the Institute For The Protection of Italian Producers. The certificate of the system IT01 is a tool of protection act to ensure, to the public, the origin and the artisanal quality of the production entirely made in Italy. We manufacture products of high quality, adhering to the more stringent rules as regards to raw materials and production cycle. For this we use only leather hides of first choice and apply avant-garde production technology and techniques. The choice of leather seating is a choice of quality, and testifies to the perception of a noble material that transfers in the domestic world the uniqueness of the Italian style. We are dealing with the raw material with natural processes and ecological care, with the same human care so that we can ensure maximum comfort and the extreme quality of our products. We hope you bring one of our creations into your home, and enjoy the comfort and quality we have maintained as the bedrock of our company. The Flat Sectional by IDP Italia. 100% made in Italy. A very plush and supremely comfortable sectional, with a pillow top arm rest and adjustable head rests. Both are key features to ensure you can enjoy personalized comfort and relaxation. We particularly love the pillow like arm rest. When you stretch out on the sofa end, you can rest your head as if atop the perfect pillow. This premium group is in stock. Pease see below for more details. 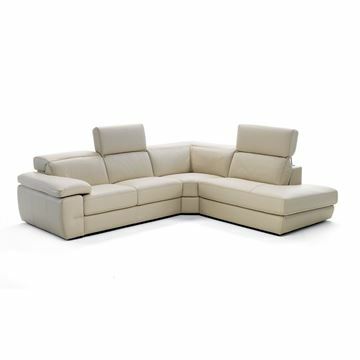 The Briana Sectional by IDP Italia. 100% made in Italy. 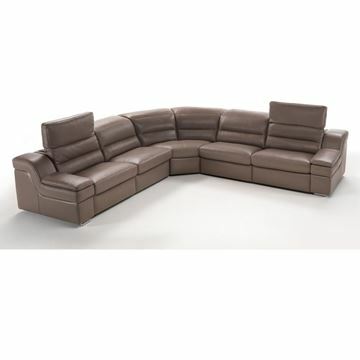 A supremely comfortable sectional, with ratcheted arm rests and head rests. A key feature to ensure you can enjoy personalized comfort and relaxation. We particularly love the adjustable arm rests. When you stretch out on the sofa end, you can adjust the angle of the arm rest to become the perfect pillow. It makes reading a book or even taking a quick nap something of a regular thing! The polished stainless legs continue into the arm, making a sophisticated enhancement to this beautiful design. This premium group is in stock in two leather colors. Please see below for more details. 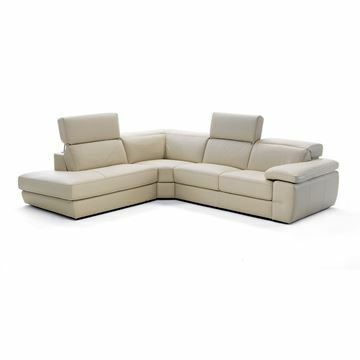 The Funes Motorized Reclining Sectional is a clean lined modern design. There are three motorized reclining seats in this configuration; one at each end and one of the armless seats. Made in Italy by Sets Italia. The plush and extremely comfortable seat cushion is made even better by the pillow-soft headrest. We find that the design and positioning of the headrest makes for perfect relaxation and head support in all seating and reclining positions. Undoubtedly one of the most comfortable and popular reclining sectional designs available in the marketplace today. This premium group is in stock in two leather colors. Please see below for more details. The Erica Sectional, crafted in Italy by IDP Italia Sets Group. 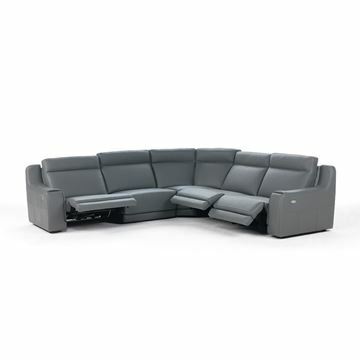 The Erica is a very plush yet supportive design, configured with electric recliners at each end of the sectional. The substantial wide track arms are padded and plush to the touch. We really enjoy the quality and attention to detail that is demonstrated in every piece made by IDP Italia. This premium group is in stock in two leather colors. Please see below for more details.